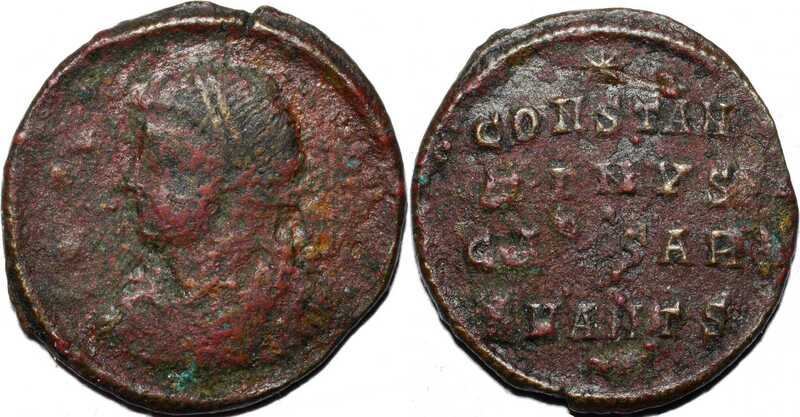 CONSTAN/TINVS/CAESAR in three lines; star above. SMANTς in exergue. Dot under m.m. UNLISTED OFFICINA - ς. RIC lists for this type officinae Α, Β, Δ, Є and Η (p. 687). Note that attribution is uncertain. There are many deposits on rev. and dot under m.m. is hard to identify. If there is no dot, the coin is ANTIOCH 54 (officina ς listed). Weight 1.90 g; diameter 18.22 mm. From Paweł Kubiczek's collection.